Yeah yeah yeah....I know Memorial Day was quite a while ago, but I'm just now getting to scan some of my first color 4x5 work. I've shot tons of black and white but had an opportunity a while back to grab some Fuji NPS 160 4x5 on the cheap. Perfect time to give it a run. Steph grew up in Monroe, LA and we end up there from time to time...like this past Memorial Day / her sister's graduation from high school. 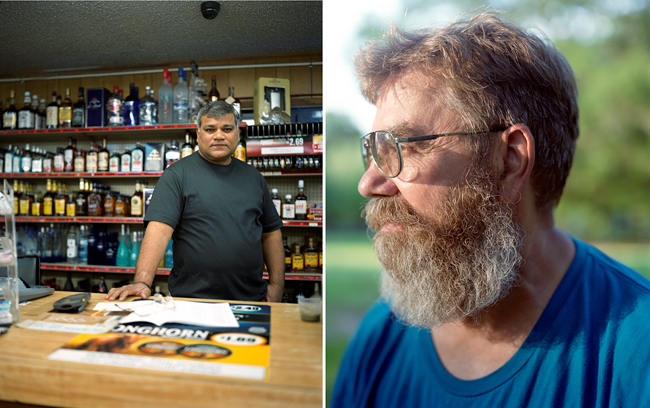 Aside from the big graduation party (mmmmm....Crawfish boil) I decided it was time to finally take a portrait of their friend Raj who owns a gas station near their home. He's long told Stephanie about his travels and life in India and London (all his stories are fascinating, by the way) but I'd never met him. What better way to meet someone than to lug a 4x5 camera into their store and offer up a handshake. I shot some instant shots (posted one of those before, I think) and a few color sheets. Above you'll see Raj in his store and Steph's dad, William, modeling his then-seven-month-old beard after finishing up his crawfish boiling duties.